NAVIGATION: Home » Frequently Asked Questions (FAQ) » What Are State Citizen Initiative Review Commissions? What Are State Citizen Initiative Review Commissions? State Citizen Initiative Review Commissions are a much scaled down version of the IQA with the authority to prevent an initiative from going on the ballot or to provide voter advice, but not independently to select an initiative for the ballot. 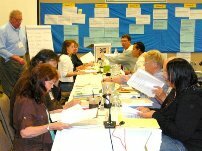 The Citizens’ Initiative Review Commission (CIRC) was established by the Oregon Legislature in 2011 (House Bill 2634). Citizens’ Initiative Review is an innovative way of publicly evaluating ballot measures so voters have clear, useful, and trustworthy information at election time. Citizens’ Initiative Review is an innovative way of publicly evaluating ballot measures so voters have clear, useful, and trustworthy information at election time. During the Citizens’ Initiative Review, a panel of randomly-selected and demographically-balanced voters is brought together from across the state to fairly evaluate a ballot measure. The panel hears directly from campaigns for and against the measure and calls upon policy experts during the multi-day public review. For each measure reviewed, a new panel is convened. At the conclusion of the in-depth review, the panel then drafts a Citizens’ Statement highlighting the most important findings about the measure. Each Citizens’ Statement is published as a prominent page in the voters pamphlet as a new and easily accessible resource for voters to use at election time. A panel of 20 Oregonians convened August 18 – 21, 2016 at Western Oregon University in Monmouth to consider Measure 97. They heard from subject matter experts and proponents and opponents of Measure 97 and had the opportunity to ask questions and deliberate among themselves about the information they are receiving. At the conclusion of the review, the panel produced a Citizens’ Statement to give voters key facts about the measure and arguments for and against its passage. The Citizens’ Statement ​will be published in the 2016 Voters’ Pamphlet. For more information about the 2016 CIR, contact Healthy Democracy​. According to ORS 250.143, citizen panelists and moderators shall separately convene to evaluate procedures related to the Citizens Initiative Review and submit reports to the Commission summarizing the evaluation, along with any recommendations. Each year in which evaluations are conducted, the Commission shall review the evaluations and make any findings and recommendations. The Commission shall also make all such evaluations, findings, and recommendations available to the public. Click here to read the evaluations and CIRC’s Findings and Recommendations​During the Citizens’ Initiative Review, a panel of randomly-selected and demographically-balanced voters is brought together from across the state to fairly evaluate a ballot measure. The panel hears directly from campaigns for and against the measure and calls upon policy experts during the multi-day public review. For each measure reviewed, a new panel is convened. At the conclusion of the in-depth review, the panel then drafts a Citizens’ Statement highlighting the most important findings about the measure. Each Citizens’ Statement is published as a prominent page in the voters’ pamphlet as a new and easily accessible resource for voters to use at election time. Citizens’ Initiative Review Commissions are also under development in Colorado and Arizona; others considering them are Washington, Massachusetts, and the European Union.